The Long-nosed Peccary (Mylohyus nasutus) was a large North American peccary that lived from the late Pliocene to the early Holocene. Among other peccaries it is most notable for its relatively large size, long legs, and elongated snout for which it is named. The genus name Mylohyus comes from the Greek words mylo, “molar”, and hys, a female pig or sow. This name is in reference to the animal’s bunodont* cheek teeth. 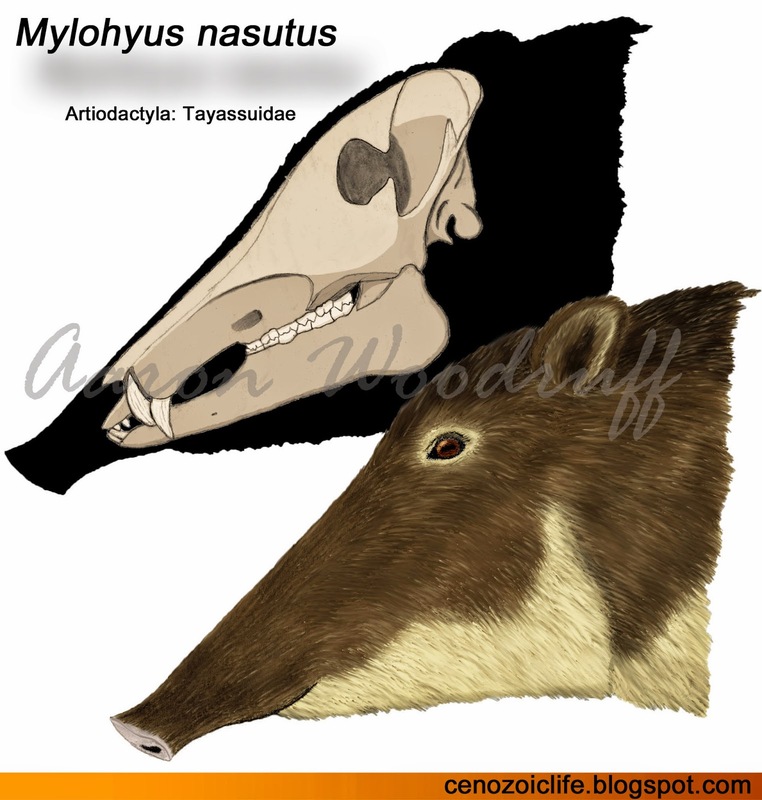 Nasutus is a Latin word that literally means large- or long-nosed, hence the common name for this species being the “Long-nosed Peccary”.Traditionally, other names have been attributed to other Pleistocene-age Mylohyus specimens (M. fossilis, M. browni, M. pennsylvanicus, M. lenis, M. gidleyi, and M. exortivus) based on minor variations in their teeth and skulls. 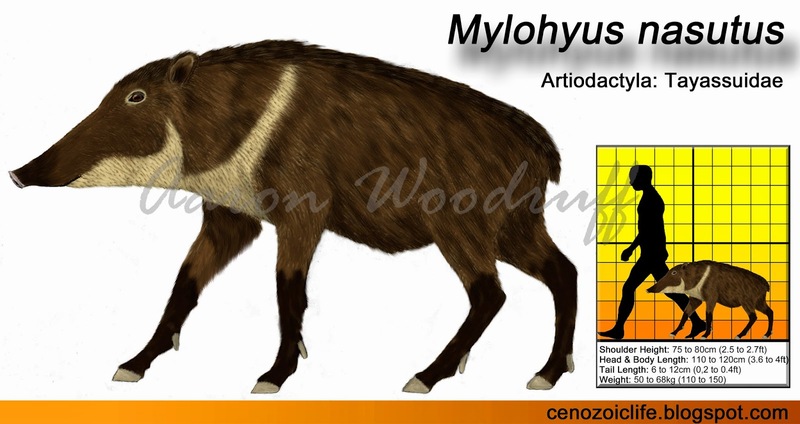 Such differences are, however, more likely to be the result of sexual, individual, geographic, or temporal variation within a single species and it is now widely accepted that just one Mylohyus species was present in North America during the Pleistocene. Long-nosed Peccaries lived throughout the North American continent from the east coast to the west coast and from Canada to Central America. This species seems to have preferred to live in the well-watered woodland and forest habitats within its range. Fossils of these peccaries are typically found in association with those of other forest-dwelling animals such as tapirs (Tapirus), beavers (Castor), flying squirrels (Glaucomys), jumping mice (Zapus), and mastodons (Mammut). Unlike the contemporary Flat-headed Peccary (Platygonus compressus), Long-nosed Peccaries are rarely found in cave deposits suggesting that caves were less frequently utilized if at all. The elongate skull of the Long-nosed Peccary comprises over a third of its total body length. Its snout, for which it derives its common name, is lengthened by long diastema* between the canines and the anterior premolars. 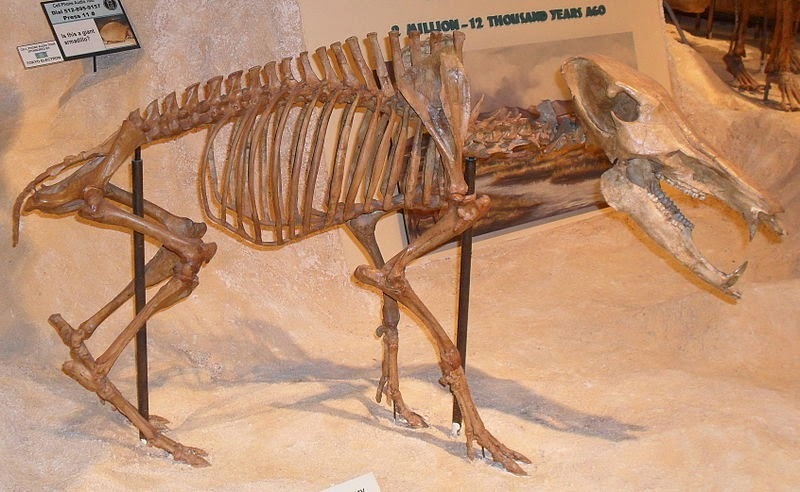 Compared to the contemporary Flat-headed Peccary (Platygonus compressus), the Long-nosed Peccary was overall much larger in size, had longer and more slender limbs, a larger head, and a shorter tail. It retained four digits on the forefeet and three on the hindfeet. To support its large head, Long-nosed peccary had forelimbs that were slightly longer than the hindlimbs and high thoracic spines, placing its center of gravity over its shoulders. Its auditory bullae* were significantly larger than those of other peccaries, possibly indicating a superior sense of hearing. Long-nosed Peccaries had a dental formula of 2/2, 1/1, 3/3, 3/3. The incisors are highly reduced, forming little more than rudimentary pegs. The canines are relatively small both proportionally and absolutely to those of extant peccaries and to the Flat-headed Peccary. The bunodont cheek teeth are adapted for crushing. All of the premolars are molariform and the molars themselves are quite robust and possess additional cusps, particularly the third molars. Although they shared very much the same distribution, Long-nosed Peccaries are much less common in the fossil record than the Flat-headed Peccary, suggesting that the former lived in smaller social groups perhaps numbering 2 to 10 individuals. Long-nosed Peccaries also do not appear to have utilized caves as frequently as its distant cousin. Like extant peccaries they were likely diurnal and monogamous. Family groups would have would have moved around their territories in regular daily, seasonal, and annual patterns. The herd territory and individual members would be marked frequently by a scent gland on the rump. Females would have given birth to 1 to 4 precocial young which were capable of eating solid food within their first month of life. Long-nosed Peccaries seem best adapted to browsing on the leaves, flowers, fruits, and twigs of overhanging shrubs and trees. Equipped with a flexible neck, elongated skull, and long forelimbs, it was able to access food higher off the ground than other peccaries. The cheek teeth were well equipped to handle woody plants. As with modern peccaries, the Jaguar (Panthera onca) would have been a major predator of the Long-nosed Peccary with attacks from Cougars (Puma concolor) being mostly limited to the young. There is also evidence that wolves would occasionally kill or simply scavenge from the carcasses of these peccaries as well. Auditory bullae: the hollow, bony structure at the base of the skull which encloses the middle and inner ear. Bunodont: referring to cheek teeth with rounded, bumpy cusps. Diastema: a gap between the teeth.